Robert Pattinson can't explain it – he just knew. It was early 2015, and the Twilight star was now three years removed from Edward Cullen, the iconic vampire heartthrob who made the British actor's name but had also painted him into a corner. Looking to break free, the then-29-year-old star began seeking out daring dramas and working with filmmakers like David Cronenberg, David Michôd, Werner Herzog and James Gray. He was determined to prove that he wasn't just a YA pinup. And in the midst of that reinvention, Pattinson stumbled upon a promotional still for Heaven Knows What, a gritty, unsparing 2014 New York indie about a homeless woman ravaged by heroin addiction. "It really struck me," he says softly, sitting in a Beverly Hills hotel suite, remembering the moment. "You normally see really striking imagery in a lot of European movies. But it's rare to see that coming out of American independents." Pattinson knew nothing about the movie – he hadn't even seen a trailer. Nor had he seen any of the previous films by its directors, the brothers Josh and Benny Safdie. But, looking at that image, he knew: He had to be in business with these filmmakers. So Pattinson emailed them. "When I like something, I get unbelievably enthusiastic," the actor explains with a warm, ingratiating smile. "The first email I sent was like, ‘I'm completely certain that we're supposed to do something together.' And they're like, ‘Have you seen any of our stuff?' I said, ‘Nope, don't need to see it. I know.'" 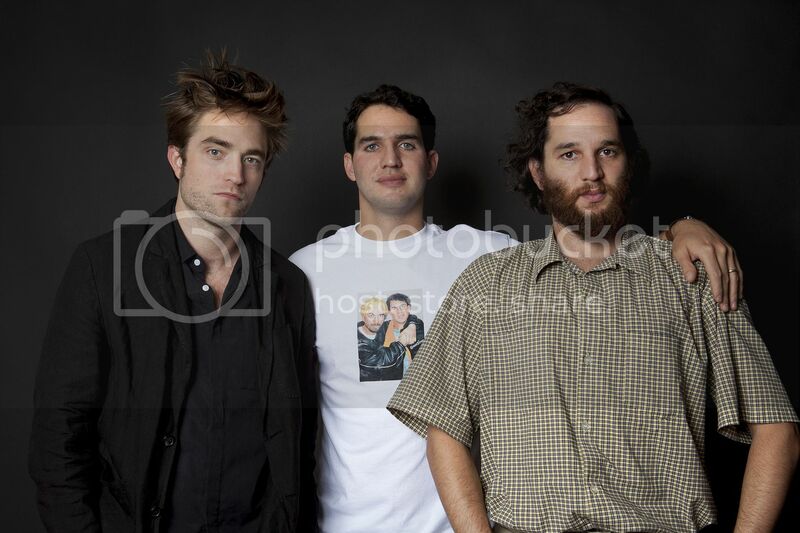 Click HERE to keep reading more from Rob and the Safdie brothers! These are from the Good Time premiere in NYC. Demi Moore, Chloe Sevigny, Peter Sarsgaard, Ashley Benson, A$AP Ferg and Fat Jew joined Josh and Benny Safdie at the Tuesday night bash, complete with Sprite bottles and White Castle sliders. Robert Pattinson had a Good Time with directors Josh and Benny Safdie at the A24 title’s New York premiere Tuesday night. The drama stars Pattinson as a small-time criminal who attempts to race against the clock to break his brother out of prison after a botched bank robbery. After shooting the adrenaline-filled film, “I’m more confident in my body than I used to be,” Pattinson told The Hollywood Reporter at the SVA Theatre. “It’s something about growing up as an English person — you’re very physically inhibited. I’ve done a few movies where I’ve actively tried to be more physical and break through my levels of inhibition and self-righteousness. It’s difficult. But as soon as I saw their last movie [Heaven Knows What] — it’s so kinetic — I just knew I wanted to do something with them." Robert Pattinson is earning rave reviews for his intense and electrifying performance in A24’s crime thriller, “Good Time.” Under the helm of directors and brothers Josh and Benny Safdie, the “Twilight” star hides his dashing good looks to portray a grimy, bleached blond, goatee-sporting, crook from Queens, New York, who embarks on a mission to bail his mentally impaired brother (played by co-director Benny) out of prison after a failed robbery attempt. While taking on the demanding role, Pattinson said the experience has helped him mature into a commanding actor. Critics have no doubt that Pattinson has developed into a masterful dramatic actor. He and the “Good Time” creators received a rousing six-minute standing ovation at the Cannes Film Festival last May where the movie first screened for an audience. The picture — out in theaters on Friday — currently holds a 94% positive rating on Rotten Tomatoes. Ever since his teen heartthrob days, Robert Pattinson has rarely been able to escape the prying eyes of fans and photographers. So it came as quite a shock to him that he was not once recognized while filming his latest picture “Good Time” on the streets of New York. His role as Connie Nikas, a gritty Queens-born miscreant whose protective impulses toward a mentally challenged brother (Ben Safdie), propels the 100-minute narrative like a runaway F train.